Fashion label Kirrin Finch responds to the demand for conscientious apparel designed to fit a range of bodies of all genders. Brooklyn, New York based founders and partners Laura Moffat and Kelly Sanders Moffat design to fit their own style preference for button-up shirts and bow ties, but tailor the garments to fit better than traditional menswear. Their collections reject traditional stereotypes and give people the freedom to be their true selves. 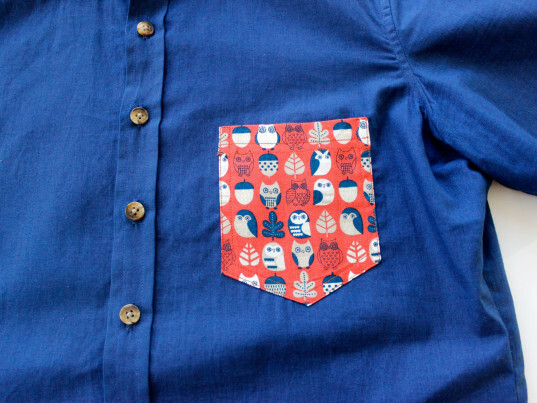 In addition, the garments are crafted from all-natural fabrics and are colored with low impact dyes. The Moffat’s were so passionate to start Kirrin Finch that they left their former teaching and neuroscience careers, and joined Pratt Institute’s Brooklyn Fashion + Design Accelerator in order to bring their vision to life. We chat with the Moffats to learn more. How did the start at at the BF+DA influence the outcome of the collection? When we first joined the BF+DA we had the loose idea that we wanted our collection to be sustainable, but hadn’t dived into the specifics of what that could possibly mean. Once we met with our BFDA sustainability mentors, Tara St. James and Carolyn Shafer, we realized that sustainability can cover many different areas including transport, dyes, fabrics, repair and reuse, packaging, washing, etc. We are also fortunate to be surrounded by other brands that have been doing this a lot longer than us, so we have made sure to tap into their knowledge about different approaches to sustainability. As such we expanded our thinking about how we could incorporate sustainable practices into our business model. In our first collection we are using organic fabrics and corozo buttons in many of our shirts, as well as manufacturing locally in New York City, and shipping with recycling packaging. But this is just the start. We have goals to add additional sustainable practices and materials as we grow. It is so interesting that your backgrounds are in teaching and Neuroscience. How did you get started in sustainable fashion? It is actually kind of ironic, because neither of us had a huge interest in fashion growing up. We were typical tomboys, climbing trees, dressing scruffy, and not worrying about what we wore. But as adults we began to be frustrated with the limited clothing options for women who don’t want to wear dresses or typical womenswear. It was in the process of looking for clothes for our wedding that we realized how difficult it is for women like us to find alternative options to a wedding dress. We were lucky we found a suiting company that made us custom suits, but I think this made us realize there was a huge opportunity to create clothes that have the design and aesthetic of menswear fit for a range of female bodies. Clothing is often an outward expression of a person’s personality, so it is really important that we provide people options that allow them to show their true identity. How do you approach sustainability in your design and production? Sustainability is something that is core to who we are as people and to our brand. But no matter what, you have to design something that people see and want to buy, regardless of what it is made of. Secondly it has to fit great. If it doesn’t fit, customers are not going to buy it a second time, or they will just send it back and there goes your opportunity to have a viable business. Fit is especially important for our customers, because they see menswear designs they want all the time, but they don’t buy them, because they are designed to fit men, and don’t fit the majority of women. So the goal is to create a uniquely designed great fitting product that can be made using sustainable materials and practices. However, it can be challenging to use sustainable practices and practices. 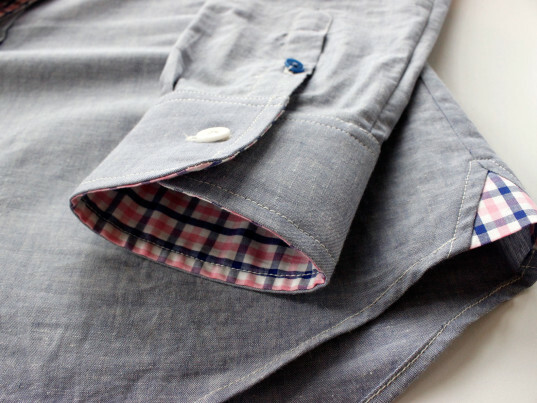 For example, organic fabric options primarily come in solid colors or weaves, like chambrays and oxfords, but not in checked or print patterns. To help solve this problem, as we grow our goal is to create our own organic fabrics, so we can incorporate bolder and more interesting sustainable fabrics. Additionally, we are creating our samples in Brooklyn and manufacturing in Manhattan. We see the value of working with local companies, reducing the carbon footprint of our products and being able to closely oversee production. However, local manufacturing does have its downsides, one of which can be an increase in price, but we believe the pros certainly outweigh the challenges. And we know that many customers value locally made garments. How is your collection changing mind sets about gender-based fashion? There are a variety of small new companies trying to create clothing options for people who don’t fall within the traditional gender binary. Big fashion companies are also getting into the game, but we think they are doing it, because they see it as a trend, not necessarily because they want to make their customers options that allow them to be their authentic selves. It is great that as a society we are being more open and accepting about breaking gender boundaries in fashion, but we think it is important to recognize that for many of us, this is not a trend…we have always had this style. For us, it is about giving these people an opportunity to wear clothes that make them feel good about themselves, and also providing a platform to express themselves freely. We are using fashion as the channel to do this, but we think it goes far beyond fashion. We are fortunate enough to live in New York City, where just about anything goes, but we have had customers in rural areas explain that they can be fired from their jobs for not wearing clothes that match their gender identity, or felt the delight from the Mother of a trans-son who has finally found some options for him to wear. We are not going to make the world a more open and accepting place by ourselves, but I think if enough companies start putting efforts towards this, then we can build enough momentum to create real change in society. What are you most proud of about Kirrin Finch? Fashion label Kirrin Finch responds to the demand for conscientious apparel designed to fit a range of bodies of all genders. Brooklyn, New York based founders and partners Laura Moffat and Kelly Sanders Moffat design to fit their own style preference for button-up shirts and bow ties, but tailor the garments to fit better than traditional menswear. Their collections reject traditional stereotypes and give people the freedom to be their true selves. In addition, the garments are crafted from all-natural fabrics and are colored with low impact dyes. 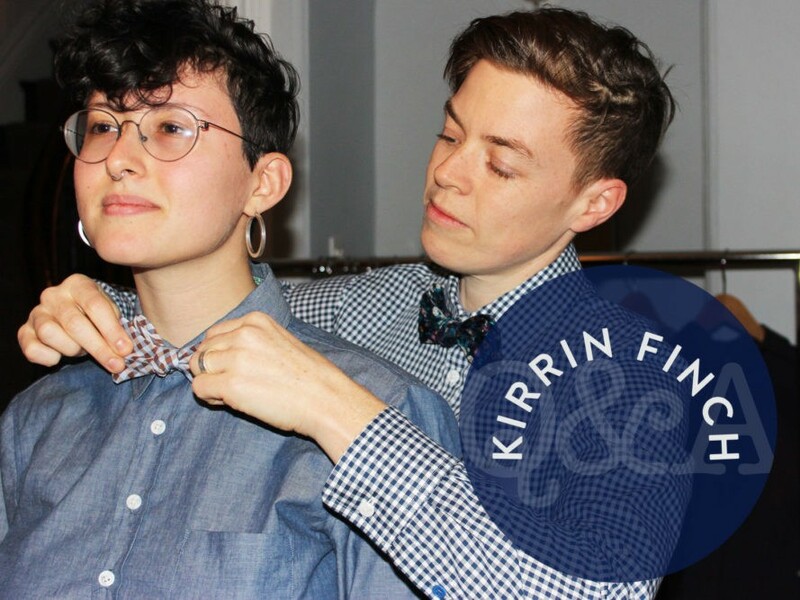 The Moffat�s were so passionate to start Kirrin Finch that they left their former teaching and neuroscience careers, and joined Pratt Institute's Brooklyn Fashion + Design Accelerator in order to bring their vision to life. We chat with the Moffats to learn more.